Gaja are based in the heart of the village of Barbaresco itself. On both sides of the immaculately-clean, main street up to the church, are the buildings of the winery and the business headquarters. The business expanded to acquire much of this property under the guiding influence of Angelo Gaja, whose efforts from the 1960s onwards firmly established the family organisation at the top of the Barbaresco pyramid. We were fortunate to get an appointment in 2017, and were welcomed by Francesca Picchi, hospitality manager and recent oenology graduate, who had joined Gaja only a couple of months before. Interestingly, she was also on the WSET Diploma programme. 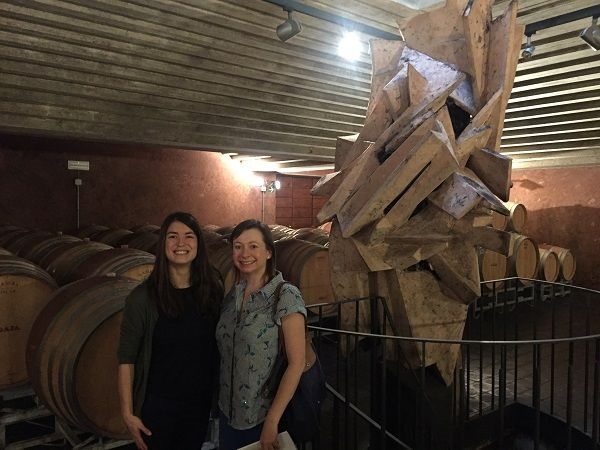 She took us out into the nearby vineyards that Gaja own, and we discussed much of their current viticultural practices before stopping in at the winery for a short tour, then finishing with a tasting of the current range. Later, we were joined briefly by Angelo’s daughter Rossana Gaja whilst we were tasting. As we were leaving, we had a chance to meet her elder sister, and main face of the Gaja business these days, Gaia Gaja. Both signed my label of their 1990 Barbaresco, in Book 3. It was clear from the precision of the visit, from what we learned about Gaja’s approaches especially in the vineyard, and from tasting the end-products, that Gaja’s reputation is justified. 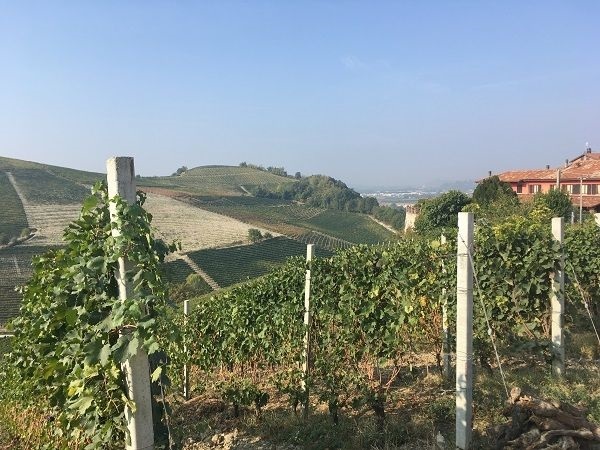 Despite already being at the forefront of wines from the Langhe, there still seems a sense of restlessness in the next generation, looking for higher standards and being willing to allow the wines to evolve. The 2013 Sorì Tildìn single vineyard Barbaresco demonstrated the skill of their craft with Nebbiolo, yielding a wine that is compact and with a long future of development ahead of it, but with finely-sculpted structure, finesse and length, while the Sperss 2000 demonstrated longevity. Finally, the Gaia & Rey Langhe Bianco 2006 showed both dimensions with a Chardonnay of complexity, density and balance – and still youthful at 11 years. Today, Gaja control 96Ha in the Langhe, producing 350,000 bottles per year. 80% is Nebbiolo for both Barbaresco and Barolo, with Chardonnay and Sauvignon Blanc also planted. 3 white wines are made, 95% of which is Chardonnay and 5% Sauvignon Blanc, with both varieties being barrel fermented. A big shift for the business occurred in the 1950s and 60s, after which only estate grapes were used and only the best vintages are bottled, with under-grade wines sold-off in bulk. 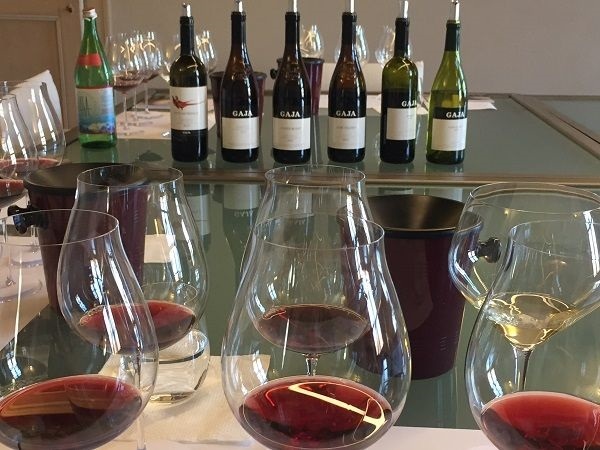 For example, in 2012 no single vineyard Cru bottlings were made as they were not good enough, and only a straight, blended Barbaresco released. This is one of the many innovations that Angelo Gaja is credited with bringing to the Langhe, driving modernisation of both viticulture and vinification. Those include vertical planting to allow mechanisation, planting Chardonnay, as well as the introduction of barriques and new wood for maturation and for white wine fermentation. Our visit showed that innovations are continuing today, in particular with adoption of sustainable farming practices and adaptations of the vineyard to manage both increases in and variability of temperature as a result of climate change. Following the process from vineyard establishment to annual work, the first innovation has been setting-up of their own vine nursery system. 2 nurseries have been established in Barolo and Barbaresco. These are being stocked with massal selections of Gaja’s existing old vine plots. This, in and of itself is not so innovative; what is, is that, working with a local professor with expertise in plant genetics, the vines they select are ones that have apparently survived disease. If vines in a given growing season are showing signs of illness, they are marked with a red strip and treated. Any that recover over the next 4-7 growing seasons are marked with a blue strip. 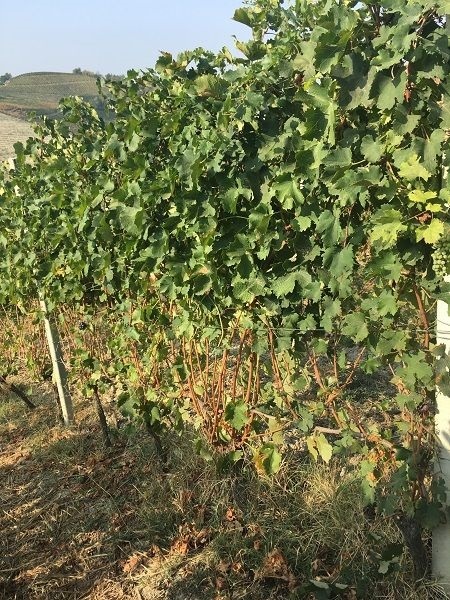 It is these blue-tagged vines that are selected for propagation, as they have shown natural disease resistance, thereby allowing Gaja to select for genetic resistance to diseases. 2 nurseries have been set up in Barolo and Barbaresco, using this careful, massal selection from their old vine plots. Vines are planted on a 0.5 x 2m planting frame for high density that encourages vine competition and targets quality over quantity – another of Angelo’s innovations based on observations in Bordeaux and elsewhere. But they were also early adopters of vertical planting over contoured, horizontal planting in the 1970s, as already noted, to allow mechanisation alongside that higher density. Soil management involves alternation of ploughing and seeding cover crops by row, depending on vintage, to balance water use and soil fertility. Cereals and / or legumes like fava beans are sown to de-compact and aerate soils, as well as retain topsoil as an anti-erosion measure. This varies by vintage too, so in 2017 it was cereals that were sown. Inter-row grasses are rolled rather than cut in dry years, to create a water-retaining mat, whereas they are cut in wet years to encourage re-growth and manage excess water, in the same manner that Olivier Humbrecht MW does at Domaine Zind-Humbrecht. Compost is added in Autumn, using their own compost made over the prior 12 months, from cow manure, grape skins, leaves and pruning wood. American red worms are used in the composter, to drive decomposition because they stay in place, rather than wandering off! Their pruning method, known as ‘willow-tree’ is designed to keep vines trunks straight, thereby leading to fewer wood cuts to minimise fungal infections of pruning wounds. With grapevine trunk diseases of increasing concern to the likes of Marco Simonit and Richard Smart, and no cures in sight, this is foresighted. 4-5 spurs are left, creating a mini-head behind the main cane. During the growing season, they practice ‘accappanatura’ (which I hope I’ve correctly spelled), where the tops of shoots are folded into the top training wire, rather than cutting and trimming. They find this balances vine vigour better and more importantly, discourages growth laterals that can both shade fruit and then require tucking-in or trimming. As part of their sustainability drive, no chemical applications are made except Copper and Sulfur use for downy and powdery mildew. To keep to less than 2.5kg / Ha of Copper, they have weather stations to monitor mildew risks, and only spray at high risk times. Beehives were also recently added as a broader ‘eco-bellwether’ as well as for flower pollination. For pest management, a series of natural controls are used. Cypresses from Toscana were recently planted near each vineyard, to provide sanctuary for small birds, that in turn control insects. Mini-skirts are added to vine trunks as an anti-caterpillar measure for a type of ground crawler which otherwise eats young buds. Sexual confusion is used for grape moths. 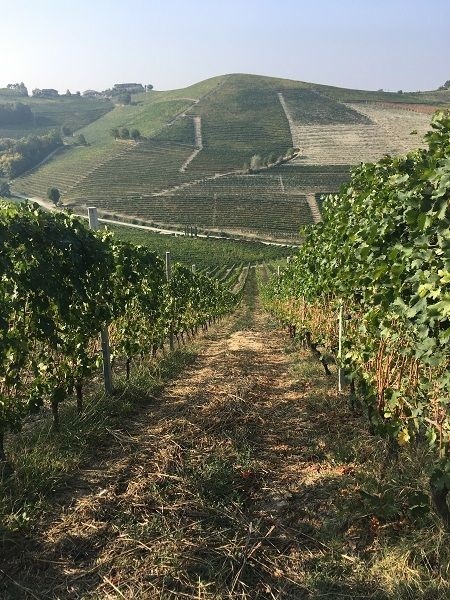 Vines for Barbaresco are harvested in 14 parcels, which remain separate through vinification and stage 1 of maturation. The winery is gravity fed. Nebbiolo is destemmed and gently crushed to stainless steel vats for primary fermentation. Temperature control comes through the winery’s basalt floor. Maceration lasts only 2 weeks. Wines are transferred to 225L barriques and more recently some 500L tonneaux for MLF then the 1st stage of maturation. Oak is French, but today is only 18-20% new, with the rest 1-4 years old. Older barrels are used only for grappa. After 12 months, wines are blended and transferred to 2-5kL old botti for the remainder of ageing – 24 months in total for the Barbareschi, but 30 months for Baroli. The botti are a mix of French, Austrian and Slavonian oak, with a range of grains and porosity, in order to give variations in levels of micro-oxygenation. Botti are therefore selected based on the vintage and tannin quality. 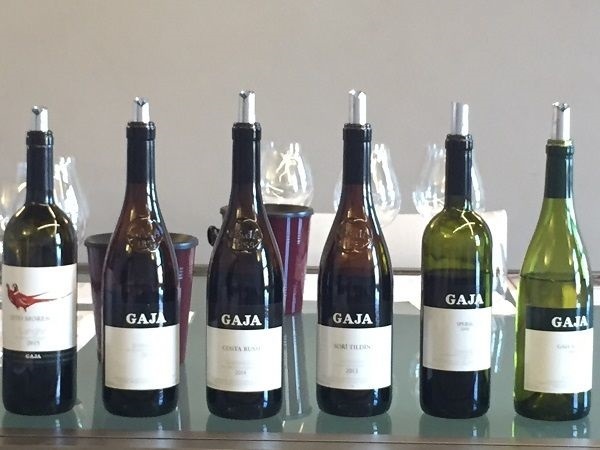 The following selection of Gaja’s wines, including both current releases and older vintages of Sperss and Gaia & Rej, were pre-selected for us by Gaia Gaja, and are in the order tasted. Part of their ‘Pheasant’ range for restaurants, designed for earlier drinking and at a more approachable price point for sommeliers. 35% Nebbiolo, 25% Barbera, 25% Merlot, 15% Cabernet Sauvignon. Before 2015 this was 35% Nebbiolo, 35% Merlot and 30% Cabernet Sauvignon, but now has Barbera from the Sperss vineyard added. Current release. 14 parcel blend. 2014 one of the coolest vintages of the last 20 years, with 22 days of rain in July and overall low average temperature, though August, September and October were dry and sunny, to allow final ripening. Roncaglieti MGA. South-facing, from the base of the vineyard – Sori Tildin comes from the top of it, as Sori means top of a hill. 70-75 year-old vines – the oldest in the estate. Same winemaking for all Barbareschi, with the only differences being in vintage and vineyard. Top of the Roncaglieti MGA. More even, elegant vintage, with good phenolic and sugar ripeness. 94% Nebbiolo, 6% Barbera. 4-6% Barbera included between 1995-2011, following the method that Angelo’s father used, therefore declassified into Langhe DOC rather than Barolo DOCG. “Sperss” means nostalgia – reflecting memories of harvesting as a child. From 2013 Nebbiolo in purezza, so has now been returned to DOCG Barolo, under Gaia’s generation. 2000 was a balanced, moderate temperature vintage; not a great vintage but a ‘classically’ styled one. From Serralunga d’Alba, Marenca e Rivette MGA. Tasted at the end to avoid oak-influence confusing the red tasting. 100% Chardonnay, with barrel fermentation, full MLF, then 6-8 months’ barrel maturation with battonage. First Chardonnay vineyard in the Langhe. Brand is named after Gaia Gaja and her grandmother Rey, with the vineyard planted in 1979, the year Gaia was born.